Important Note: In considering blood pressure medications, WaterCures.org does not advocate stopping blood pressure medications without your doctors supervision. It is our hope to open a dialogue with doctors about this topic. When you read the science below, perhaps you too will think we need a change in the way health care cares about us. Let me repeat...Do not change your medications or add anything new without the supervision of a competent doctor. To do so could result in serious health consequences. The information here is not intended to diagnose treat or cure. It is only for informational purposes and if you are under a doctors care, you need to continue that care or find a qualified ND (Naturopathic Doctor) to put you on a different treatment regimen. We are not anti doctor as some alternative sites are. We are working with doctors to get research to prove what we have seen in our own research. It can take between 12 to 30 years for major changes in healthcare to take place. We are trying to take the first steps to accomplish this. In this regard, we are not the first and what we share is not new. The work of Dr. Batmanghelidj and the many doctors and nurses who worked on the ORT protocols were the first modern day implementers of what we are promoting. The science behind what we suggests actually dates back a few thousand years. Also, we are not the first to point out the dangers of blood pressure medications. Blood Pressure Medications: Did Your Doc Tell You? Informed consent requires that you know the risks vs rewards and the options in the use of blood pressure medications. Please note that not every doctor knows all the options. Doctors do not use alternatives because of the lack of research. This is especially true of medications for blood pressure. This is a very controversial topic. One site with several negative comments about this site included one who said he was a medical doctor. Here are two more notable comments about this site. Please note, where anyone makes a specific argument against any part of this site, we find the science about the topic and include it here. "I do believe that as a Medical Doctor (MD) I have every right to look at these kinds of alternative medicine with a pinch of salt." "Lack of Medical Evidence ultimately weighs more than someone's verbal claims. I have nothing against you or your site but my views about curing with water and salt is unchanged." "Any medical professional pushing this should be looked into by the authorities. It risks getting people killed. What is so sad is that there always is going to be a market for snake oil." Remember those comments as you read the evidence, er, eh, peer reviewed published medical research on blood pressure medications that follows. And we are not an essential oil website, let alone promote the use of snake oil. There is more information on the dangers of blood pressure medications than can be covered in one page on this site. We are not going into the most damming. Herbert found that being on calcium channel blockers for just under 5 years could result in brain shrinkage away from the skull and IQ decreasing. Lets look at medications for blood pressure from another side. We have provided the links and the comments from the peer reviewed journal articles. In this study of pharmacologically treated hypertensive patients, antihypertensive drug regimens that did not include a thiazide diuretic were associated with an increased risk of ischemic stroke compared with regimens that did include a thiazide. These results support the use of thiazide diuretics as first-line antihypertensive agents. This says that basically high blood pressure medications increase the risk of stroke. If you take a thiazide to get rid of the excess water, the risk goes down. But, at what cost? What are the risks of taking thiazides? Hyponatremia (low salt) is prevalent among elderly, especially in women and with thiazide diuretics. (italics ours) Apart from the trend toward sodium depletion observed in healthy elderly which occurs due to changes in the tubular handling of sodium, a multifactorial etiology including thiazides seems to predict the occurrence and the severity of hyponatremia. Hyponatremia may be a significant cause of mortality in seniors. A relatively younger age, male gender, association of cirrhosis, malignancy, and hypoalbuminemia predict mortality. In elderly outpatients, identification of the risk factors for hyponatremia and close monitoring are imperative to reduce the related mortality and morbidity. This is saying....Not enough salt may be the cause of premature death in seniors. What could cause it? Thiazide diuretics (and telling everyone to cut back on salt without regard to their individual unique needs or body makeup). The J Hypertens. 2015 Jun;33 Suppl 1:e94-5. doi: 10.1097/01.hjh.0000467607.00612.e0. In this large retrospective cohort study of hypertensive men and women from Sweden, we could identity a protective effect on osteoporotic fractures among current users of thiazide diuretic drugs independent of blood pressure level. However, the risk of fracture was found to be increased in patients shortly after discontinuation of treatment compared to patients never prescribed thiazide diuretic drugs. This is saying that if you stop taking them, you increase the risk of broken bones increases. Ok, this is a bit weird. It needs further study. In Practitioner. 2014 Dec;258(1777):15-9, 2. In an article titled....'Patients with gout can be cured in primary care. But, what is a little...as the article said...."causes 'the worst pain ever experienced' is characteristic of an acute attack" pain when your doctor can bring your blood pressure down. Besides, there is another drug to cure the gout. Curr Hypertens Rep. 2004 Apr;6(2):106-10. Based on the Antihypertensive and Lipid-Lowering Treatment to Prevent Heart Attack (ALLHAT) Trial, the Joint National Committee on Prevention, Detection, Evaluation and Treatment of High Blood Pressure states that "thiazide-type diuretics should be used as initial therapy for most patients with hypertension." In the ALLHAT study,..... the manuscript endorses thiazide-type diuretics as first choice, based on their cardioprotective effects and low cost. It is well known that thiazide-type diuretics cause hypokalemia, glucose intolerance, and diabetes, although the ALLHAT study showed a significant 43% to 65% higher risk of new-onset diabetes with chlorthalidone (a thiazide-like diuretic) compared with amlodipine (30%) and lisinopril (18%). Things to take from this. 1) it increases your risk of getting diabetes. No problem, there is a drug for that too. Second. note that it says there is an increase in hypokalemia. This means low potassium. Numerous studies shown that the lower the potassium intake, the higher the blood pressure, and the higher the ratio of potassium to salt, the lower the blood pressure. Blood pressure medications studies are finding options that work. Natural and safe options. Consider studies from Johns Hopkins. There were several. One of the recommended..."potassium supplementation should be considered as a tool for the prevention and treatment of [high blood pressure]." This means that an inexpensive supplement could end the high blood pressure health crisis in the US and the world. Their research even showed that a small amount of potassium could even prevent new onset of high blood pressure. But wait, how would this affect the sales of high blood pressure medications? What could it do to stock prices of the pharmaceutical companies. AS Dorothy in the Wizard of Oz would say...Oh my. This is not a 'what your doctor does not want you to know thing. They don't know either because they are bound by a health care political system that dictates how they practice, if they want to keep practicing. They have to fall in line when it comes to blood pressure medications. But we digress... the study above in effect justified increased diabetes risk in those taking this drug because it did not cause more heart related problems like heart attack and strokes. Think about it...(this sounds best in a New Jersey accent) "What's a little diabetes if it doesn't increase your risk of heart attack? I'm just saying." So, even though we are increasing your risk of diabetes, its ok because we have a drug for that and it will not increase your risk of a heart health related issue. The problem with this thinking is that after a decade on the medication and with diabetes, you will have heart health related health problems. One thing for sure, the doctors prescribing these guarantee work for themselves. We have seen thousands correct their high blood pressure using either just the The Water Cures Protocol or using the advanced protocols. 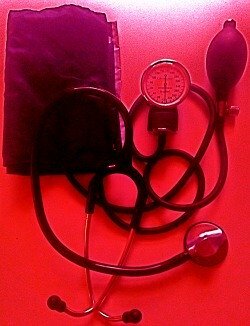 The medications for high blood pressure have unique health risks and many who have left them behind have commented on how much better they feel. They often say they cannot believe that they could get off them. The challenge you face if you are on such medications, getting your doctor to work with you in coming off those medications. If you decide to take an alternate path, we cannot stress enough that it is necessary to do this under the supervision of your doctor or a competent doctor who knows and works with alternative modalities. It would be advisable not to even start the water cures protocol without the guidance of your doctor. The salt and water could make the medications work better than intended and adjustments may be necessary. Researchers at the University of Naples, in a one-year trial on 54 patients who were on high blood pressure medications, found that potassium lowered blood pressure. Half kept their regular diet while the other half increased the potassium-rich foods in their diet. The sodium to potassium ratio was 1:1 rather than the customary 3 1/2:1. On completion of the trial, the high potassium diet consumed less medication than the other group and 38% of them discontinued the medication. The group on the potassium-rich diet also reported a significant (55%) reduction in symptoms related to their hypertension. Please NOTE: Increasing potassium intake by self diagnoses can be dangerous when using certain diuretics. In The Netherlands, a double-blind study by Dutch and Belgian researchers looked at oral supplementation with magnesium as a way to lower blood pressure in women suffering from mild to moderate hypertension. With 91 women between 35 and 77 years of age who did not use high blood pressure medications and a systolic blood pressure between 140 and 185 mm Hg (diastolic pressure between 90 and 105 mm Hg). The participants were randomly assigned to two groups. One group received a placebo while the other group received 485 mg per day of magnesium aspartate-HCl. Both were supplied in the form of four packets of water-soluble powder per day to be taken with meals. At the end of the six-month trial, the systolic blood pressure in the magnesium group decreased by 2.7 mm Hg and the diastolic pressure by 3.4 mm Hg when compared to the placebo group. The researchers conclude that oral supplementation with magnesium aspartate- HCl may effectively lower blood pressure in those suffering from mild to moderate hypertension and are not taking medications for high blood pressure. The Netherlands Erasmus University Medical School researchers discovered a natural mineral salt that lowered blood pressure in people suffering who had mild to moderate high blood pressure. Called "Saga Salt" (Akzo Nobel, Netherlands), it it is found in Iceland and has 41% sodium chloride, 41% potassium chloride, 17% magnesium salts and 1% trace minerals. It was a randomized double blind placebo controlled clinical trial in 100 men and women aged 55 to 75 years. The blood pressures of those in the trial had systolic blood pressures between 140 and 200 mm Hg and diastolic pressures between 85 and 100 mm Hg. Half the group used the mineral salt in their food and they could add the salt to their food. The other half used ordinary table salt (sodium chloride). Blood pressures were measured at the beginning and after 8, 16 and 24 weeks. At eight weeks, those on the mineral salt had a significant reduction in blood pressure. The systolic blood pressure (measured at 8, 16 and 24 weeks) decreased 7.6 mm Hg and the diastolic pressure by 3.3 mm Hg in those on mineral salts when compared with the control group. At week 24 the participants returned to using ordinary table salt resulting in no difference in blood pressures between the two groups. The researchers came to the conclude that replacing common table salt with a low sodium, high potassium, high magnesium mineral salt can effectively lower blood pressure in older people suffering from mild to moderate hypertension. When we consider the dangers of blood pressure medications, we have to ask, what if there was a better way. We recognize that our anecdotal experience with thousands is not the same as clinical research that has in many cases been funded by pharmaceutical companies with a bias and in numerous cases have paid shills doing the research. As one peer reviewed journal called it...'Systematic bias favours products which are made by the company funding the research.' BMJ. 2003 May 31; 326(7400): 1167. But we have to ask...in view of the danger to life and health with high blood pressure medications and since we recommend less salt than a saline IV and the Water Cures protocol is nothing more than the oral version of a saline IV, what would it hurt to try this in clinical practice. Many doctors have and are getting the same results we are. They just do not want to be exposed to the scrutiny of people like the commenters above. The question is, how do you look at the peer reviewed studies? Or do you even look at them? How does a doctor justify the medications with the increased risk and side effects? More importantly, we are seeing the Water Cures work. Why would someone not want to try it and prove us wrong? It is nothing more than the oral version of a saline IV. You read the medical science above. The water cures is nothing more than the oral version of a saline IV (yea, repeating it because somehow this just does not sink in). Another wrote...."Any medical professional pushing this should be looked into by the authorities. It risks getting people killed. What is so sad is that there always is going to be a market for snake oil. "Just who are the snake oil salesmen? Just to set the record strait, we do not promote essential oils, we promote fluid and electrolyte balance. One final word of caution....DO NOT start adjusting your potassium on your own. It could cause a fatal heart arrhythmia. Only do what your doctor or pharmacist tell you to do. But in combination with medicines such as Vasotec (enalapril), Capoten (captopril), Lotensin (benazepril), Aceon (perindopril), Accupril (quinapril), Altace (ramipril), Mavic (trandolapril), or Zestril (lisinopril), salt substitutes and potassium supplements could be disastrous. Too much potassium can cause fatal heart rhythms. Potassium supplements should only be taken under a doctors supervision. The Water Cures Protocol to learn how water and salt can lower your high blood pressure.